Product code: ES3767 Categories: Sold Items, Sold Rings. 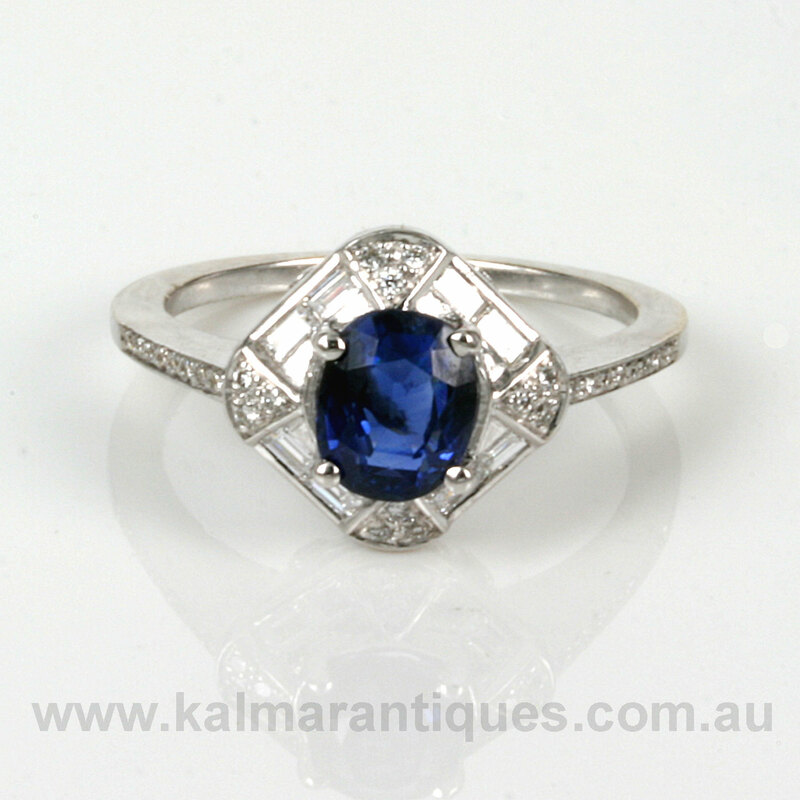 This sapphire and diamond ring would look simply divine on any finger including making a wonderful engagement ring and is also a fantastic example of where old meets new. Set in 18ct white gold, this modern ring is set with an antique Ceylonese sapphire and surrounded by diamonds in a style reminiscent of the 1920’s Art Deco period. The gorgeous Ceylonese sapphire was taken out of an antique ring that was damaged beyond repair so it was decided to give it a new lease of life here in this ring. The sapphire measures 1.50 carats in weight and has such a fine blue colour to it with excellent transparency allowing you to see all the way through the sapphire. Surrounding the sapphire are 12 round brilliant cut diamonds as well as 8 baguette cut diamonds then on each band are 8 more round brilliant cut diamonds. As though this was not enough, there is a further round brilliant cut diamond on each side of the setting to add even more charm and character to this ring. In total the 40 diamonds total 0.28 carats and are all F to G in colour and VS in clarity meaning they are all lovely white diamonds that are very clean of inclusions as well. From left to right the top of the ring measures 12mm by 11.5mm and sits so perfectly on the finger. 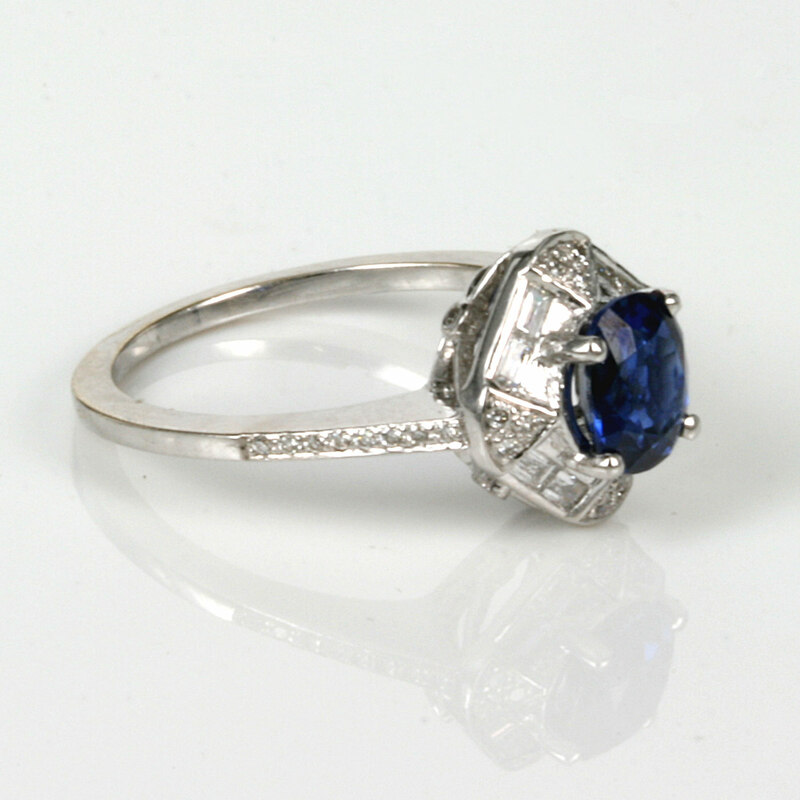 The pure blue colour of the sapphire really stands out set amongst not only the diamonds and the white gold, but also the design of the ring and has that wonderful unique aspect about it of being brand new with an Art Deco feel to it all the while having a genuine antique cut sapphire sitting proudly in the centre.